Admit it. 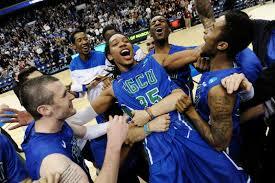 You had never heard of Florida Gulf Coast University prior to their stunning upset victory in the first round of the 2013 NCAA men’s basketball tournament. It’s ok. You were not alone. Nobody else in the world knew who they were either, which is why the servers which ran the Florida Gulf Coast Athletic Department website crashed multiple times on Sunday evening, after FGCU won it’s second game in the tournament to secure their spot in a Sweet 16 game. The massive surge of traffic resulting from people trying to figure out who Florida Gulf Coast was, literally knocked their site offline. Technical difficulties aside, that is incredible! For a blogger, website mechanic, or anyone else trying to boost their traffic numbers, there are important lessons to be learned here. Some times all it takes is one powerful event to get your name on the map. As a blogger, this might be one link from an uber popular and highly trafficked website. This might be a product endorsement from a major news outlet. This might be bad press that suddenly draws you into the spotlight. Whatever the event, be it good or bad, there are ways to harness this surge of traffic to your advantage. You should prepare your blog or website like you are expecting a tidal wave of traffic at any minute, even if you have no idea it is coming. How can you do this? When your servers crash from a wave of unexpected traffic, your web host will become your best friend. The customer service number you may have never used will suddenly be on speed dial. You also do not want to wait until your servers crash to determine whether your web host’s customer service department is up to snuff. I don’t suggest orchestrating a crash on your own site, but you should at least contact their customer service department with a routine service question to experience their response time and ease of use. This way, when it hits the fan you will know you have an ally in your corner. If you don’t already have a web provider, or you want one with documented excellent customer service, I highly recommend BlueHost. I have used BlueHost for a number of years on this blog, as well as all of the other websites that I run and they have never let me down. In fact, they were able to restore one of my websites after I made a bonehead change and erased my entire site! The bottom line is that we may never know when we can expect a massive surge of traffic. We can however, prepare to make the most of it if and when it does happen!